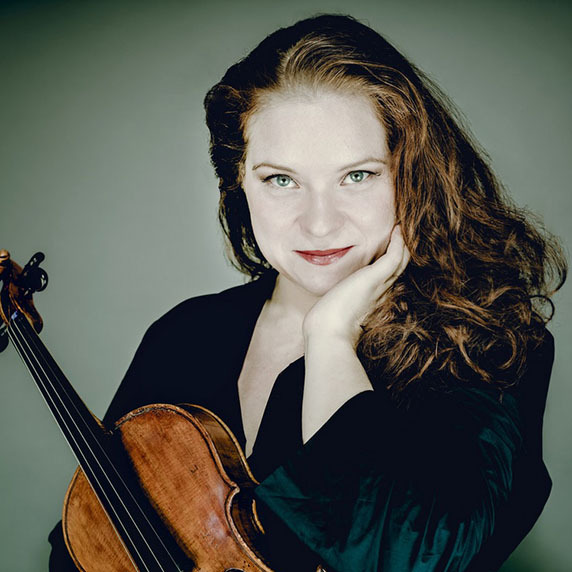 Violist Nora Romanoff-Schwarzberg is recognized as a musician with a captivating charisma and is a regular guest on international stages. Both as a soloist as well as a chamber musician she has performed in prestigious venues and festivals such as the Musikverein and Konzerthaus Vienna, Salle Pleyel in Paris, DeSingel Antwerp, Teatro Colón in Buenos Aires, Tchaikovsky Conservatory in Moscow, Progetto Martha Argerich in Lugano, Mantova Chamber Music Festival, Podium Festival Esslingen, Heidelberg Spring Music Festival, Sommets Musicaux de Gstaad, and the Salzburg Festival. As a soloist she has played with the Orchestra della Svizzera Italiana, the Zagreb Chamber Orchestra, the Orchesta Filarmonica di Bacau, the Kristiansand Symphony Orchestra, the Philharmonic Orchestra of Irkutsk and the Argentinian Camerata Bariloche under the baton of Ion Marin, Alexander Verdernikov, Hobart Earle, Pierre Amoyal and Jacek Kasprzyk. Among her chamber music partners were outstanding musicians such as Mischa Maisky, Gabriela Montero, Renaud Capuçon, Andrey Baranov, Lilya Zilberstein, Lily Maisky, Sergey Nakariakov, Henning Kraggerud, Enrico Dindo, Martha Argerich and Ivry Gitlis. Nora was involved in the PODIUM Festival Esslingen from its first edition and a guest at the PODIUM Festivals in Iceland and Norway. She is co-founder of the PODIUM Festivals in Croatia and Austria. Her performances were broadcasted by stations such as the BBC, RETE 2, RAI, Radio Klassik Stephansdom and Ö1. Her CD recordings were released by labels such as Naxos and Gramola, as well as by EMI Classics and Warner Classics as part of the annual series “Martha Argerich and Friends”, which were GRAMMY-nominated several times. Born 1985 in New York and raised in Vienna, Nora carries on her family’s musical tradition in the fourth generation and gave her debut as a soloist at the Konzerthaus Vienna at the age of 11. Among her teachers and mentors in her artistic formation were her mother, violinist Dora Scharzberg, Michael Kugel, Thomas Kakuska and Hatto Beyerle (both members of the Alban Berg Quartett), Yuri Bashmet and Johannes Meissel. Nora studied at the Royal Conservatory in Maastricht and completed her studies at the University of Music and Performing Arts Vienna. She herself has given master classes in Israel, Norway, Bosnia and Herzogovina and the USA and teaches viola and chamber music at AMADEUS school Vienna. Since 2013 she is part of the Ensemble LUX, that focuses on contemporary music for string quartet. As a member of the Lipkind Quartet Nora toured throughout Europe and the USA and recorded two CD’s. Nora plays on a Viola from Pietro Pallotta from 1790, that has most generously been donated to her by the late Lady Magaret Kagan.